Kick off your visit on the 7th (Sun): explore the striking landscape of Taeanhaean National Park. Keep things going the next day: kick back and relax at Batgae Beach and then take a peaceful walk through Anmyeondo Island Recreational Forest. To see traveler tips, other places to visit, photos, and other tourist information, refer to the Taean-gun itinerary builder. Toronto, Canada to Taean-gun is an approximately 19.5-hour flight. Due to the time zone difference, you'll lose 14 hours traveling from Toronto to Taean-gun. Expect somewhat warmer weather when traveling from Toronto in May: highs in Taean-gun hover around 28°C, while lows dip to 13°C. Finish your sightseeing early on the 9th (Tue) so you can travel to Seoul. Seoul is known for historic sites, sightseeing, shopping, museums, and parks. Your plan includes some of its best attractions: step into the grandiose world of Gyeongbokgung Palace, appreciate the extensive heritage of Bukchon, explore the activities along Cheonggyecheon Stream, and don't miss a visit to N Seoul Tower. To find where to stay, other places to visit, traveler tips, and more tourist information, you can read our Seoul trip builder. The Route module can help you plan travel from Taean-gun to Seoul. In May, daytime highs in Seoul are 27°C, while nighttime lows are 13°C. Wrap up your sightseeing on the 12th (Fri) early enough to drive to Sokcho. On the 12th (Fri), Head underground at Geumganggul Cave, then hike along Biryong Falls, and then tour the pleasant surroundings at Ulsanbawi Rock. On your second day here, explore the striking landscape of Seoraksan National Park. To see maps, reviews, traveler tips, and tourist information, use the Sokcho trip builder. Drive from Seoul to Sokcho in 2.5 hours. Alternatively, you can take a bus. Traveling from Seoul in May, expect nights in Sokcho to be about the same, around 14°C, while days are slightly colder, around 23°C. Finish your sightseeing early on the 14th (Sun) to allow enough time to drive to Gyeongju. Kick off your visit on the 14th (Sun): contemplate the long history of Cheonmachong, see the interesting displays at Gyeongju National Museum, and then contemplate the waterfront views at Anapji Pond. Here are some ideas for day two: explore the striking landscape of Gyeongju National Park. To find more things to do, photos, ratings, and tourist information, read our Gyeongju sightseeing planner. You can drive from Sokcho to Gyeongju in 4.5 hours. Other options are to take a bus; or fly. When traveling from Sokcho in May, plan for a bit warmer days and about the same nights in Gyeongju: temperatures range from 30°C by day to 15°C at night. Finish your sightseeing early on the 16th (Tue) so you can drive to Busan. You'll explore the less-touristy side of things at Gwangalli Beach and Yongdusan Park. 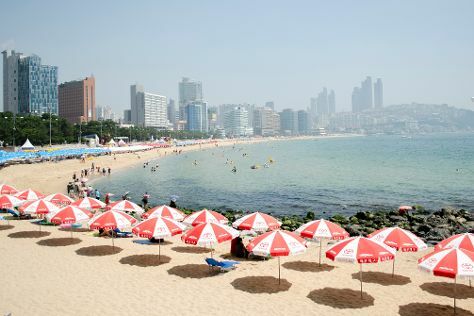 And it doesn't end there: kick back and relax at Haeundae Beach, appreciate the history behind UN Memorial Cemetery, take some stellar pictures from Taejongdae, and make a trip to BIFF Square. To see ratings, other places to visit, where to stay, and tourist information, use the Busan trip itinerary builder. Drive from Gyeongju to Busan in 1.5 hours. Alternatively, you can drive; or do a combination of bus and train. Traveling from Gyeongju in May, you will find days in Busan are cooler (15°C), and nights are about the same (15°C). Finish your sightseeing early on the 18th (Thu) to allow enough time to travel to Seogwipo. You'll discover tucked-away gems like Jeongbang Waterfall and Hallim Park. 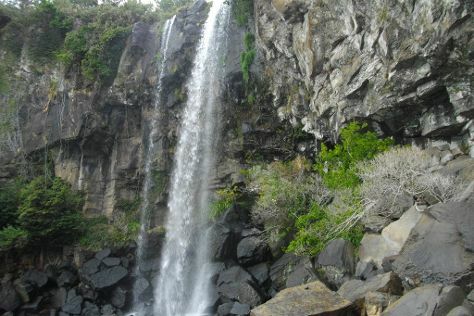 Get outdoors at Cheonjiyeon Falls and Hyeopjae Beach. Change things up with these side-trips from Seogwipo: Jeju (Jeju Kimnyoung Maze Park, Manjanggul Cave, & more). And it doesn't end there: take in the dramatic natural features at Jungmun-Daepo Jusangjeolli Cliff, take in the views from Saeyeongyo Bridge, and stroll through Pyoseon Haevichi Beach. To find maps, where to stay, traveler tips, and more tourist information, go to the Seogwipo online itinerary creator. You can do a combination of flight and bus from Busan to Seogwipo in 3 hours. Other options are to do a combination of car and ferry; or do a combination of bus and ferry. While traveling from Busan, expect a bit warmer days and about the same nights in Seogwipo, ranging from highs of 24°C to lows of 17°C. You will have some time to spend on the 23rd (Tue) before leaving for home.